An exhibition of 400-year-old imperial robes was opened in Dingling Tomb Museum in Beijing on Dec 12, 2016. 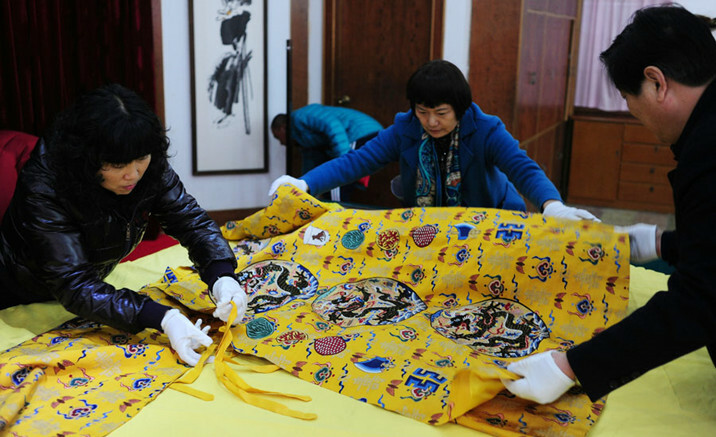 Produced by weavers from the Nanjing Brocade Research Institute for two years, replicas of nine ancient silk fabrics pieces unearthed from the tomb were officially shown to the public. The Dingling Museum is a museum of Chinese imperial mausoleum. Built on Sept 30, 1959, the museum is located in Changping District of Beijing. Here in Dingling (Ding Mausoleum) lie buried Emperor Shenzong of the Ming Dynasty (1368 - 1644) and his two empresses. The mausoleum was first built in 1584 and completed in 1590. It is known that the silk fabrics unearthed from the tomb have a total of 644 pieces, and one hundred of the 644 have been successfully copied. Experts claimed that they would continue working on reforming those have already been copied and making new replicas.